This machine features a number of improvements made to the Lefort Midway range and is fitted with a 600HP Scania diesel engine and has a capacious 8.0 metre pre-compression box and updated 180T baling ram to make light work of even the toughest material. This new machine has double the shearing pressure of or first machine, a Lefort 500T Static Shear which was purchased over 20 years ago. The new Lefort Midway is the second Midway 1000T Shear we have chosen since this model was first launched in 2011, the first version originally delivered to Davidson’s in 2012. 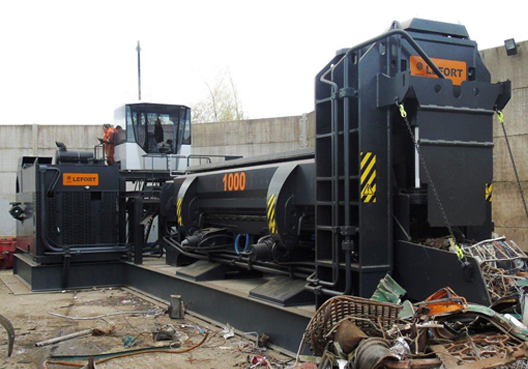 The new machine has been complemented by the purchase of a new Liebherr LH40M scrap handling machine to work alongside out 2 Fuchs machines enabling us to process approx 1,500 tonnes per week. This article was posted in Scrap Metal Processing. Bookmark the permalink. Follow comments with the RSS feed for this post.Both comments and trackbacks are closed.